Home Posts tagged "Sale-A-Bration 2012"
I am so honored to say that I was bestowed with The LIEBSTER Blog Award. It is said that Liebster is German meaning dearest, and can be used for favorite or beloved as well. In light of sharing this love I want to thank Linda Fisher (Linda’s Stampin’ Loft) for this wonderful gift of recognition. Link back to the blogger who presented the award to you…check! Copy and paste the blog award on your blog. Present the Liebster Blog Award to 5 blogs….who you feel deserve to be noticed. The five blogs I have chosen are listed below. Click on over and check out their awesome talent, take a minute to look around and don’t forget to become a Follower! I know they will appreciate it! Yes, I am still in Korea… my work here is done and I’ll be home this weekend. I can hardly contain my excitement. I breath, live, and love Stampin’ Up! My co-workers must have gone mad listening to me talk about our products and awesome company…LoL. Where we work there are no windows, no music, no cell phones, barely any Internet (when we’re lucky), and we sit in very close proximity to each other… there is no escape for 12 hours a day, five days a week. The room is a miniature cubicle city filled with at least 30 people and by the end of this week they were all exposed to Maggie Made Made Cards and Pampered Chef. How did Pampered Chef get into this blog? I share a common bond with a special nurse that works with me. We both adhere to the Direct Selling Association’s Code of Ethics. Denise is a Pampered Chef Consultant. We love to share stories about our team, our specials, my cards, business ideas, etc. Funny thing is… she’s not into crafts and I don’t like to cook… hilarious isn’t it? But… even though I don’t like to cook, she has helped me make cooking easy peasy… just like I’m bound to show her how making a card is easier than cooking… LoL. 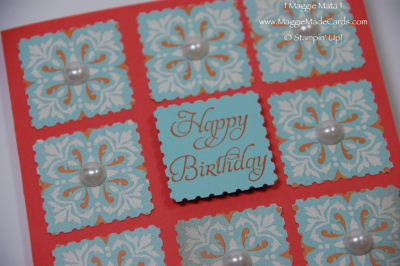 Mata-’bout Tips: When you’re short on time, as often as I am, and you need to make a card in a jiffy… grab a piece of our Designer Series Paper. They already come with pretty designs on them and you don’t have to rack your brain to come up with a design or pattern. Get your favorite paper punch. Doesn’t matter if it’s a scallop, circle, or a square… punch out eight pieces that have the same or similar pattern and place on the card as shown above. 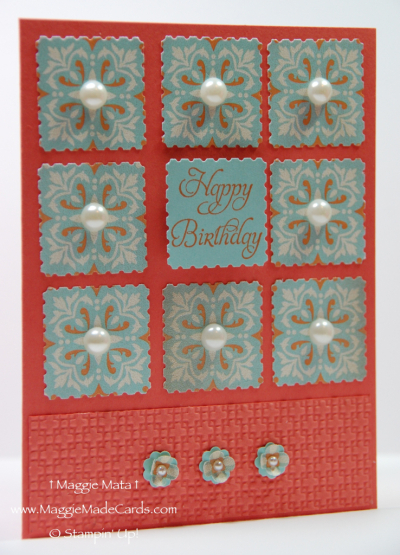 You’ll need one plain piece punched to stamp the sentiment and use stampin’ dimensionals to make the sentiment piece pop. Add pearls or rhinestones, which you can color with a sharpie or leave in their natural colors. If you don’t have paper with already painted designs… make your own with a stamp of your choice. I sincerely hope you find my tips helpful. Ecstatic News for New Starter Kits! Have you thought of becoming a Stampin’ Up! demonstrator, and then you worry about time constraints, pressure of sales, etc? I know EXACTLY how you feel! I have a full-time life in the military that requires me to travel often. I was a crafter for many years and didn’t want the added pressures of sales. I joined Stampin’ Up! as a hobby stamper and I found a whole new side of me. Within a few months I found myself sharing my crafts telling everyone I run into about paper crafts. As I write this blog, I am on temporary duty in Hawaii missing my craft room and drawing card layouts on pieces of paper while waiting in line or on the ride to work. I suppose I’m Mata-bout Paper and I want you to feel at ease when you join my team the same way I did and still do. Below is the incredible special for new demonstrators who sign up for the starter kit during Sale-A-Bration, Jan. 24th thru Mar. 31st. The amount of product you get is worth joining just for the inital supply! A great package for hobby stampers. Yay! Incredible price of $125 ($340 value) in products with free shipping and customization. An additional bonus of up to $120 in more product! FREE Designer Series Paper (DSP) or My Digital Studio (MDS) downloads every month from Feb. thru Dec. 2012. (Note: You only pay for shipping, there is no shipping charge for MDS downloads). Mix and match, FREE DSP one month and MDS the next during active status. Permanent 20% discount off SU products plus a one-time opportunity for 30% off (minimum product order of $150 and must be placed within 45 days). Earn Sale-A-Bration and Hostess Benefits on ALL orders (personal or customer orders) at discount prices. On-Line sign-up/starter kit is very easy and instant. There is NO obligation to purchase anything beyond the kit, hold workshops or classes. You have FIVE months to meet $300 in sales. Still NO obligation. If you do decide to continue quota of $300 in June, your active status renews through Sept.